The tablet war starts to heat up as ASUS announced last night not one, not two, but four new tablets, which run either Windows 7 Home Premium or Android Honeycomb with a custom user interface. 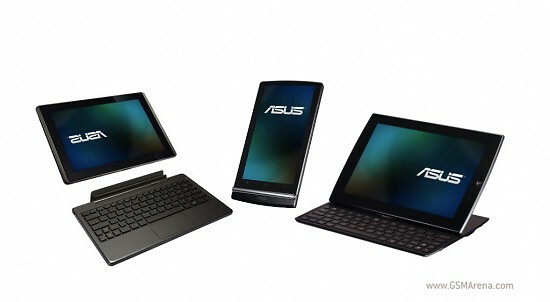 The devices in question are the ASUS Eee Pad Slider, the ASUS Eee Pad Transformer and the ASUS Eee Pad MeMO and the ASUS Eee Slate EP121. Right off the bat the devices support full HD video playback, full Adobe Flash support and decent connectivity options. Let’s start off with the Asus Eee Pad Slider. Packing a 10.1” IPS capacitive touch-screen and a sliding QWERTY keyboard that makes it look like a netbook, the tablet weighs only 2.2 pounds, which is just a bit more than the iPad. It also comes with a NVIDIA Tegra 2 dual-core processor and a NVIDIA GPU, although we don’t have much info about exact specifications of both. A 5MP auto focus snapper at the back and a 1.2MP at the front should satisfy your needs for taking pictures and video-conferencing. The connectivity is also well covered. An optional 3G module is also available as well as a mini USB port, a mini HDMI port and a Micro SD card reader. The tablet runs Android Honeycomb. The Asus Eee Pad Transformer tablet is rather interesting too. It offers an optional dock that has a full QWERTY keyboard and an additional battery making the Transformer able to run for up to 16 hours. The tablet itself also packs a Tegra 2 processor and a 10.1” capacitive touchscreen. The same front and rear digital cameras are on board, 1.2MP and 5MP respectively. The tablet runs Android Honeycomb. The Eee Pad MeMO is the smallest one of the pack with a 7.1” capacitive touch screen. Supposedly it could fit in the pocket of your jacket, but we are not sure you’d really keep it there. Unlike its bigger brothers however, it’s got a Snapdragon processor. The tablet runs Android Honeycomb. Tech-wise, it’s got the same 1.2MP and 5MP cameras as the bigger slates. It also comes with a stylus pen (judging by the size of the thing it’s a capacitive stylus). A great feature is the Micro HDMI port, which allows streaming full HD videos to an external display. And finally, the ASUS Eee Slate EP121 is a netbook-sized tablet featuring a 12.1” capacitive touchscreen with a WSVGA resolution of 1280×800. It’s powered by an Intel Core i5 dual-core processor and supports up to 4GB of DDR3 RAM. The tablet comes with Windows 7 Home Premium and will be available with either 32GB or 64GB SSD storage, which could be expanded via the SDXC slot. As standard all models have 802.11n Wi-Fi, Bluetooth 3.0, a 2MP shooter with LED Flash and two USB 2.0 ports capable of supporting PC peripherals. There’s also a mini-HDMI port for connecting to external displays.